I try to eat vegan twice a day, partly due to eco-friendliness, partly because I love veg and partly to try to lose a bit of podge. 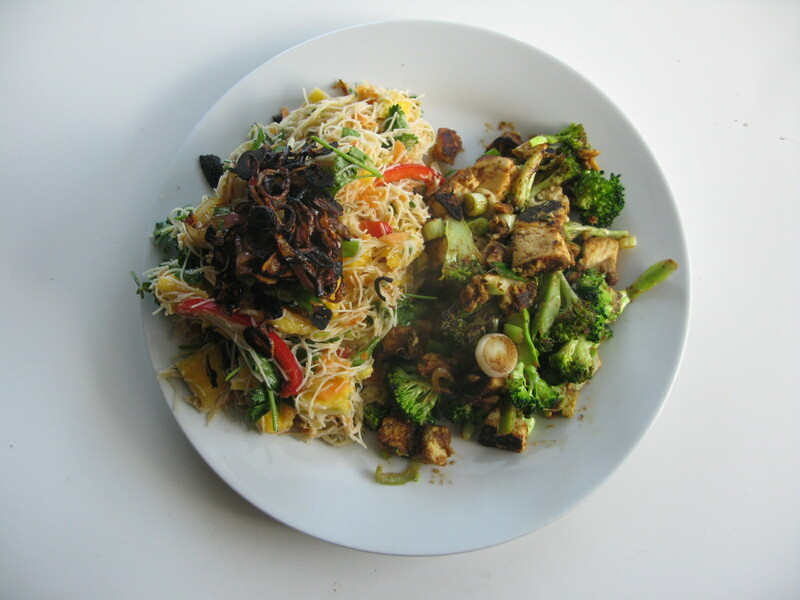 Anyway, I think my vegan recipes are pretty damn tasty so I thought I’d share one…. First prepare the salad. Soak the rice noodles in boiling water for three minutes until soft. Drain and toss with the sunflower oil. Mix the sesame oil, soy sauce, thai red curry paste, lime zest and juice and salt to make the salad dressing. Peel and slice the mango into chunks; slice the pepper, cucumber and spring onions and roughly chop the coriander. Mix all of the above together in a serving bowl and check for balance of seasonings. Chill until you’re ready to serve. For the tofu: Cut the broccoli into small florets and the tofu into chunks. Heat the oil in a pan over a high heat and add the tofu, broccoli and thai green curry paste. When the tofu is nicely browned and the broccoli is tender, add the spring onions and soy sauce. Give it all a good stir and serve immediately with the salad.